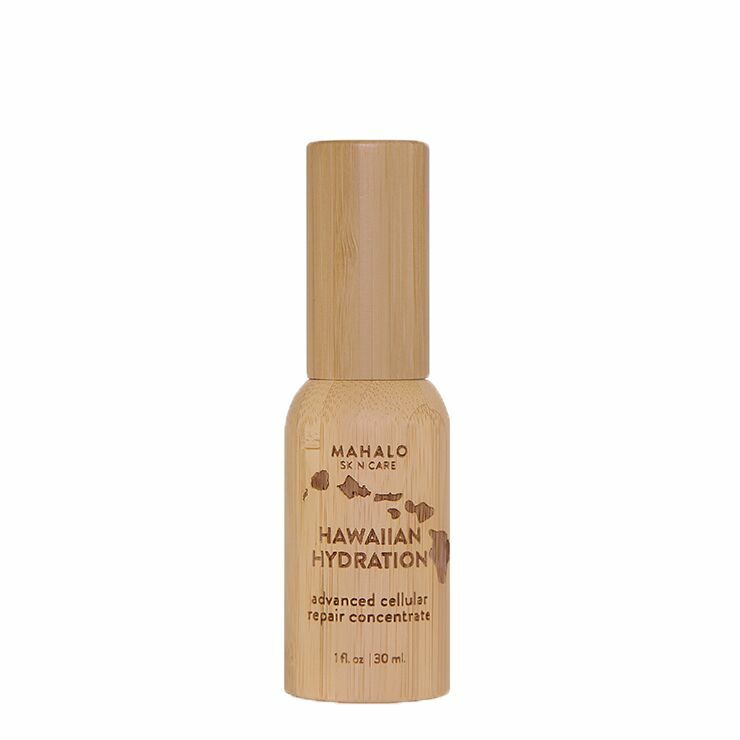 A delight for both your skin and senses, Mahalo Hawaiian Hydration Face Serum is designed especially for troubled skin. Made with sandalwood and green tea to provide a soothing experience to upset or sensitive skin types, this gel-like serum has a silky-smooth texture and carries a light, crisp floral aroma. Jasmine, sandalwood, baobab, and goji support a youthful appearance and visibly improve signs of wrinkles, sagging, and dullness. Radish and dragon’s blood make skin look clear and calm, reducing the appearance of redness and breakouts. Tamarind lends a look of even tone and glow. All combined to create a health and bright look. Apply 1-3 pumps to clean skin, warming between fingertips before applying to face, neck, and décolleté. 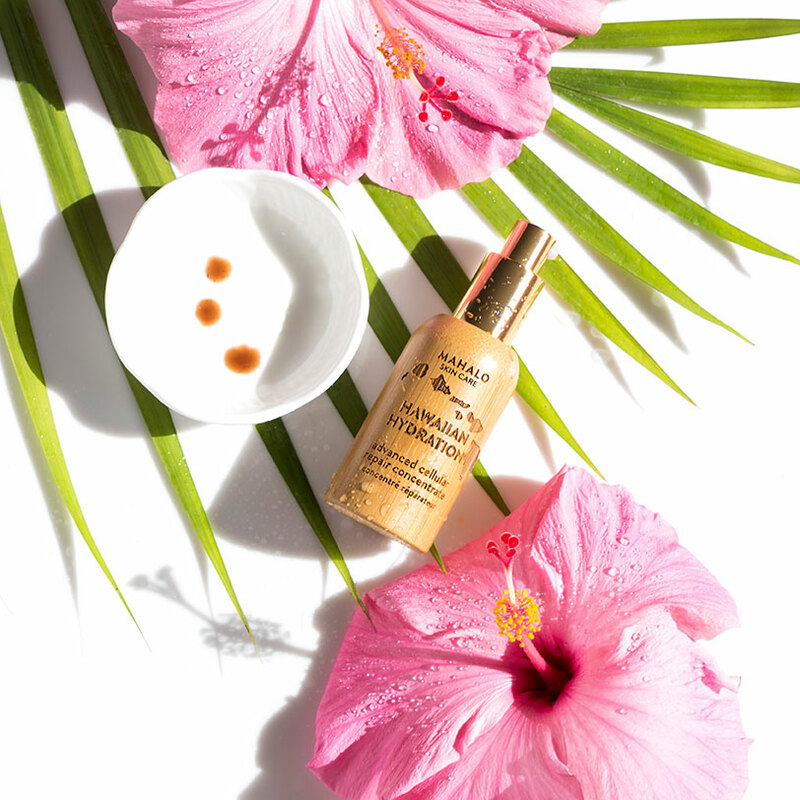 This concentrated facial serum may be used both day and night. 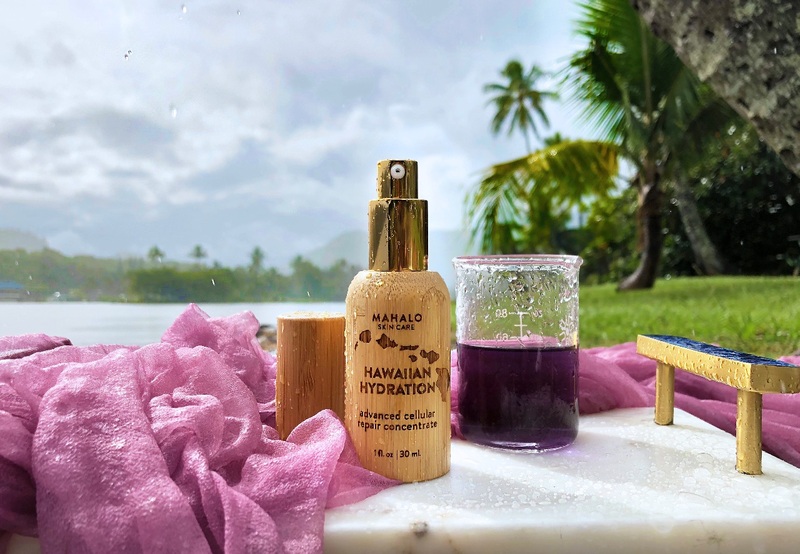 Santalum Paniculatum (Hawaiian Sandalwood) Hydrosol*, Camellia Sinensis (Green Tea) Leaf Extract*, Colloidal Copper, Colloidal Gold, Jasminum Officinale (Jasmine) Hydrosol*, Niacinamide, Terminalia Ferdinandiana (Kakadu Plum) Cell Extract*, Saccharomyces (Sea Silt) Ferment, Leuconostoc (Radish Root) Ferment Filtrate, Lactobacillus And Cocos Nucifera (Coconut) Fruit Extract, Croton Lecheri (Dragon’s Blood) Resin Extract, Glucosamine, Salix Nigra (Black Willow) Bark Extract, Lycium Barbarum (Goji) Fruit Extract*, Hibiscus Sabdariffa Flower Extract*, Helichrysum Stoechas Extract*, Tamarindus Indica (Tamarind) Seed Extract*, Iris Florentina Root Extract, Leontopodium Apinum (Edelweiss) Extract*, Magnesium Ascorbyl Phosphate (Vitamin C), Ceramide Np, Ceramide Ap, Ceramide Eop, Phytosphingosine, Cholesterol, Sodium Lauroyl Lactylate, Carbomer, Enteromorpha Compressa Extract, Hydrolyzed Adansonia Digitata (Baobab) Seed Extract*, Sodium Hyaluronate^, Glycerine, Palmitoyl Dipeptide-5 Diaminobutyloyl Hydroxythreonine, Palmitoyl Dipeptide-6 Diaminohydroxybutyrate, Xanthan Gum, Potassium Sorbate, Caesalpinia Spinosa Gum.